Growing up in the 80’s meant that you got to experience some pretty iconic games before the release of the Nintendo Entertainment System in 1985. One of those games that stuck out was Missile Command on the Atari 2600. Protecting 6 cities from missile attacks proved difficult over the course of 6 levels. 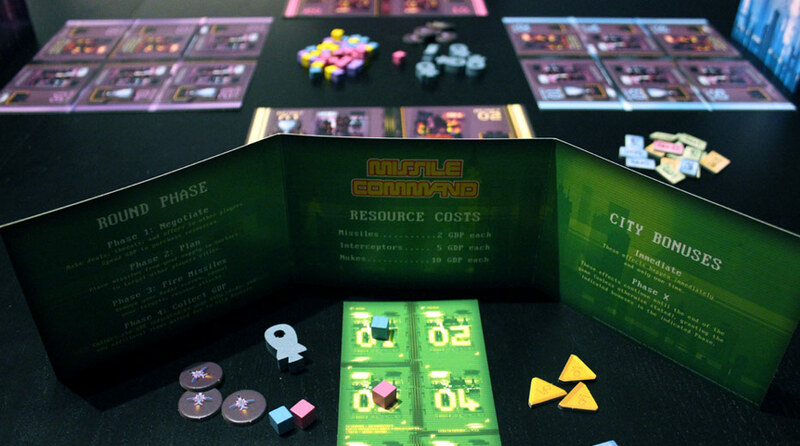 Today I’m taking a look at the table top version of Missile Command from IDW Games. Missile Command is for 3 to 6 players and puts you in control of a grid of 6 cities that you’re trying to defend from the opponents at the table. Players are given a small 2 x 3 planning grid, a cardboard shield to keep prying eyes out of your business and $15 in cardboard cash. In front of your cardboard shield, you’ll have another 2 x 3 grid that has 6 city cards laying face down. This grid contains the cities that you have to protect. The game does a good job of breaking gameplay into 4 steps. Each round allows you to negotiate with the people at the table. This aspect of the game is going to be reliant on the group you’re playing with. Playing with friends and family that you’re close to will allow you to negotiate and team up against others. These alliances are very fragile because at the end of the day, all you have is your word. Someone is probably getting stabbed in the back. Players need to spend their cash to purchase Missiles ($2), Interceptors ($5) and Nukes ($10). Players have to purchase a missile matching the color of the player that they plan to bomb. Grabbing a green block means you have the ability to bomb the green player, should you choose to use it. This is an aspect of the game that I really enjoyed. I would purchase a purple missile and let the purple player know that I wouldn’t use it as long as they kept away from my cities. I want to say this again. Play this game with the right group of people. Missile Command is not a game you can play with someone who has their feeling hurt easily. Next, plan your attack by adding missiles to the small grid behind your screen. Placing a green missile on the #2 grid space means that you’ll launch an attack on that space on the green player’s board. It’s very straight forward. Players earn victory point tokens for every successful attack on another player’s city. Players can defend their cities by choosing to play an Interceptor token when someone launches a missile at them. If you know someone has a missile in your color, you should purchase an Interceptor for defense. During the cleanup phase, you’ll get paid based on the dollar amounts shown on your 6 city cards. You’ll play through these same steps until someone has lost all 6 of their cities. The winner is determined by the victory points gathered during the game. It’s very important to bomb cities to get these points. Playing defense the whole game is a bad strategy and I’ve seen people take last place because of this. Missile Command will rely so much on the group you’re gaming with. The game is basic and there’s some light strategy here. But, all this can go out the window if someone is complaining or everyone at the table decides to decimate one person. Missile Command is a good game with the right players. One element I really enjoyed about this game was the effects of bombed cities. Bombing a city flips the card to its backside. On this side of the card, the player who owns the city is given an advantage. Some cards give you free Interceptors, another gives you a permanent discount on missiles and most of these cards will give the player more money to use. There’s a real consequence to bombing another player’s city and that’s such a cool element of this game. Some cards feel overpowered, but in the scheme of war, you have to ask yourself if it’s worth launching that missile. The art in the game leaves a lot to be desired. I feel like they were shooting for pixelated artwork and landed in a rough spot. The color choices are not friendly to players with color blindness. This is something to consider when playing. I played Missile Command with 3 people and it was fine. However, I really enjoyed my time with the game at 5 and 6 players because of the alliances that formed and of course, broke down during the game. There are definitely flaws in this game but I’ve enjoyed the games we’ve played because of the people I played with. If you can nab this game on sale, this is a fun game for a small group. Missile Command is sure to bring out the trash talk and double crossing in your game group or family. You can find Missile Command at your local game store, Game Stop or purchase on Amazon today. IDW Games provided us with a retail copy of Missile Command for this review. This in no way influenced our opinion of the game.